Understand the slippery slope bureaucrats and others in government advocate in wanting to use a "no fly" list to deny Second Amendment rights. How can a federal judge be trusted to uphold his oath to to make decisions based on law and the Constitution, when the same judge openly declares the Constitution to be irrelevant? Methinks the judge attempts to dismiss something the old white guy founders knew well: That societal norms may shift, that technologies may change, but human nature, and the nature of concentrated government power to become abusive are unchanging, and are much the same when this country was founded. Just because greater technology gives greater potential power to control people does not grant government the power to diminish freedom just because it it technically possible. 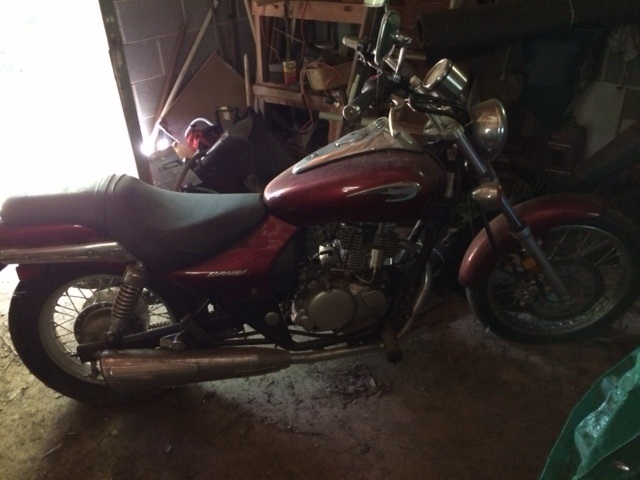 This looks to be a classic Kawasaki Eliminator motorcycle from the 1980s. Not in running condition. Not much wear, only 166 miles on the odometer, but it's been sitting for decades in the back of a work shop. Strikes me, it has great restoration potential, or could be used for nearly new vintage parts. The title and the key were lost or misplaced years ago. Anyone care to venture a guess on as-is value? The place where it's been stored in being sold as part of an estate liquidation. Hawaii's governor signs bill putting gun-owning Hawaiians on under watch across the USA for potential criminal behavior. Meanwhile, the official Paul Nehlen campaign is making use of a "dump Ryan" dump truck. 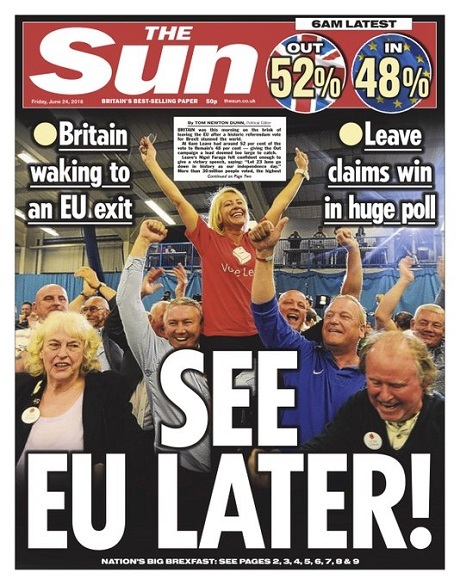 A good tabloid headline makes you look, makes you think, and is often intended to make you chuckle at the same time. "Big Three" network news is nearly silence on gun rights arguments as it advances an anti-gun agenda after Omar Mateen's Orlando massacre, according to an MRC study. It's not news these networks deliver. It's indoctrination. 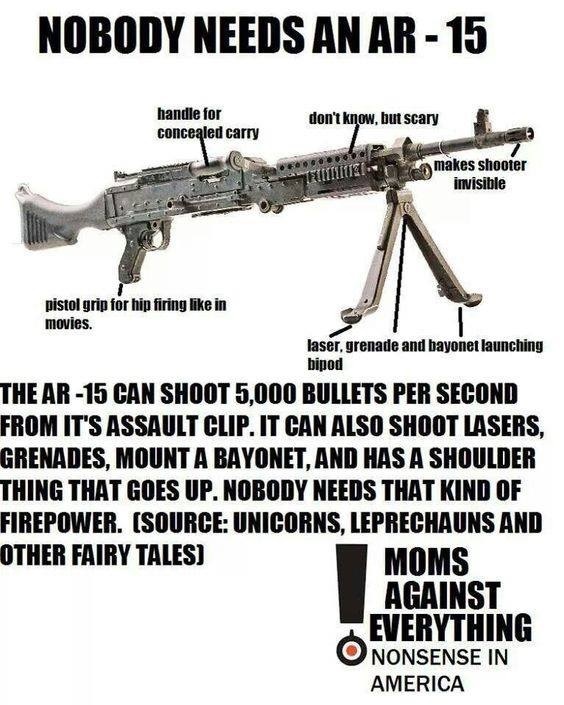 And the Left says AR-15s are scary? ...is the same President Obama who says letting guys like you and me have access to an AR-15 is dangerous and unnecessary. ... And protecting the image and reputation of Islam appears to be among the top priorities of this Obama-led government. Would this government make similar redactions had the attacker spoken of another religion or pledged fealty to the Klan or a Tea Party? This government is more focused on political correctness and the protection of Islam that it is about preserving openness in government, and fostering clear and honest media reporting that's supposed to be protected under the First Amendment. My heart breaks for the those good folks and families who suffer loss because our government chooses to protect the "rights" of illegal immigrants over those of the people these immigrants have potential to harm. Just days after Speaker Paul Ryan said he did not want to ‘clog jails’ with previously deported drunk driving illegal aliens, 14 year-old Gianna Bartolucci, died Saturday from brain injuries caused by a twice deported drunk driving illegal alien in a head-on crash last Christmas Eve in Clarkson, New York, according to a statement by her parents posted to their church website. Gianna and her father, a church pastor, might have died at the accident scene last December had witnesses not rushed to their aid, and pulled them from their burning car, according to a report at rochesterfirst.com. display. The time was within a couple of weeks of the shooting in Charleston, and followed calls by those on the political left to ban display of the flag. One or two were flying in front of businesses. Some from poles in the beds of pick-up trucks. Most were displayed porch rails or in residential yards. To be fair, I'll note that I include Georgia's former state flag, the one incorporating the Confederate battle flag on its field, in my loose count. 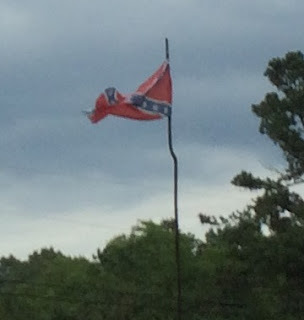 I'm thinking efforts to shame or ban display of this flag may have actually resulted in more people flying it. And the further you get from urban zones of political correctness, the more of these flags you see. This Florida sheriff talks sense, but seems to stop short of something that should be considered. It's one thing for armed law enforcement to encourage those who come under attack to fight back. But will members of Florida law enforcement call for Florida to drop its prohibition on concealed carry in nightclubs and bars? If there are sober designated drivers in the clubs who help shuttle drinking friends to and from the venue, why not allow non-drinking patrons who have carry permits to legally conceal carry. In the wake of the Orlando massacre, this seems a logical step in the right direction. Georgia handles things this way, and I can't recall hearing of any problems caused by it. "Standing in solidarity with Muslims after Orlando makes as much sense as standing in solidarity with Klansmen after the Charleston massacre. No one should be standing in solidarity with hate groups." We may open this Friday's (June 17th) Don and Doug webcast with a discussion on how to defend against and survive a mass shooting or any other type ambush attack. Don brings his experiences as an Army combat vet to the table on this one. I suspect alcohol played part in amplifying "freeze effect" in the Pulse nightclub shooting. Alcohol slows assessment and reaction. And I suspect much alcohol had been consumed by club patrons prior to an attack that began just after 2:00 am. "The end of prayer shaming"
Robb's earlier explanation of ISIS and its use of fealty can be found here. "Gun Owners Must Be Calm and Smart to Prevail in Coming Challenges"
Trump going soft on 2A? Trump going soft on constitutional protections, our right to due process? Will bureaucrats be able to circumvent or deny citizens their rights by putting their name on some bureaucratic list? I don't like the look of this... But it's Twitter, and sometimes meanings get mangled in 140-character brevity. Seems there was some sort of naval engagement on the Thames. Someone sent this my way. I'd credit the original source if I knew it. What made the Orlando shooting so deadly? Reporting says the Orlando shooter twice traveled to Saudi Arabia in the past five years, and government officials don't have a clue why. Seems a writer at that the anti-gun New York Daily News took it upon himself to fire an AR-15. "It feels like a bazooka --- and sounds like a cannon." I'd love to get this guy out to a range, and let him put a clip's worth of ammo through a WWII era Garand. Even better, how 'bout we set him up with a fire-breathing short-barreled Mosin Nagant? I kinda doubt he could handle my Grandma's 12 gauge. Suspect Mohammad Moghaddam was shot and killed after hostage taking at a Texas Walmart. We showed up early to get a good spot. 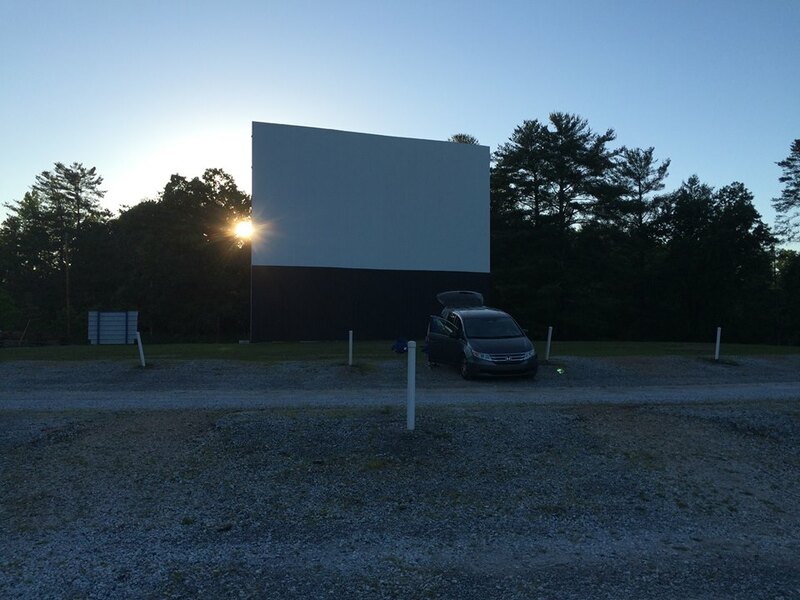 At Blue Ridge Drive-In, Blue Ridge, Georgia. I will not attempt any sort of comprehensive recap on what happened in Orlando over the weekend, others have done so, and we'll be saturated with additional media in the come days. 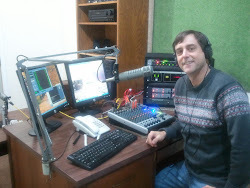 Most of Sunday, I was in rural areas, often with spotty cell service. I was focused on prospecting possible real estate purchases. Didn't even hear of the Orlando attack until a daughter made me aware late afternoon/almost early evening Sunday. Thoughts and prayers go out to victims of Sunday's attack as well as their families. But I sincerely hope those impacted by this vile attack are not naive enough to be exploited by would-be gun grabbing activists who would like to use Sunday's attack to further infringe on the Second Amendment. I know, I'm asking a lot. Among first things I noticed was the Orlando attack was that it happened in a 'gun free' zone, as it is my understanding that Florida residents and others with concealed carry permits are not allowed to bring guns into establishments that serve alcohol. We're also now told the Sunday morning attacker worked as a security guard, that he'd been reported to his employer for hostile comments on the job, and had previously been interviewed by the FBI over potential ties to Islamic extremism. Just days before the Orlando attack, ISIS vowed a major attack on Florida. Prior to this attack, the Orlando killer declared an allegiance to ISIS, apparently so there would be no mistaking his motive. Yet, there are those in government (and elsewhere) who downplay or deny Islamic influences were at work in the Orlando attack, and are likely at work even now plotting additional attacks. Political correctness provides no protection. 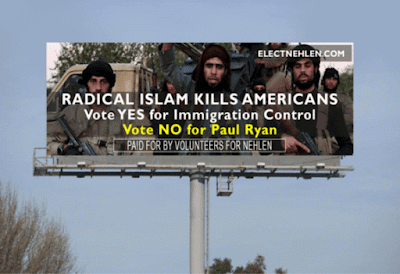 In fact, it appears political correctness provides layers of cover for those seeking to commit mass murder. It's time America loses this PC mindset when it comes to Islam, and face up to the fact there are indeed adherents to Islamic teaching who openly advocate waging a violent and bloody war on the American home front against those they see as failing to submit to societal norms advocated in the Koran. We' went from the 'Greatest Generation' to the Boomer Generation. Then came the Millennials. Affluence, self-indulgence and mollycoddling seemingly brings on societal decline in record time. 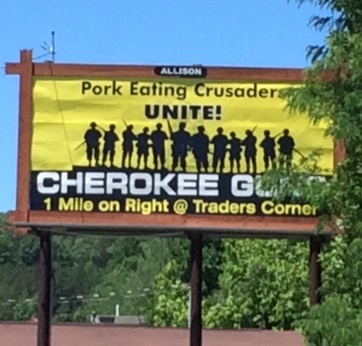 Wonder what the PC crowd would say of this billboard seen in Murphy, NC. Looking for real estate bargains? I haven't fully vetted the site, but Georgia Public Notice looks like an awesome tool for those monitoring real estate foreclosures in multiple Georgia counties. Foreclosure traffic looks at a snails pace compared to six to eight years ago. Then again, there are those who believe we're on the verge of another economic downturn that will again drive a foreclosure trend. The concept of securing America has been turned on its head. The bureaucracy that's supposed to be securing our border has been morphed into a force and infrastructure that supports and facilitates invasive migration. Is it a stretch to say fifth columnists now control federal bureaucracy, and openly work against the best interests, and contrary to the laws, of the nation? Expecting to close on a rental property I'm selling early next week. And I'm scouting additional real estate for purchase beyond the bounds of the metro area. So things are a little busy. When traveling, I'm deliberately staying off Interstate highways. Gotta say, I seem to be seeing more closed businesses along roadsides, and there'd be more empty storefronts than there are in small town downtowns if it weren't for antique stores and thrift shops. Even some communities without big box competitors in close proximity seem to have lost many, if not most, their new-trade retailers. Drove a stretch of state highway yesterday where I went at least 20 miles without seeing a functioning gas station. On the flip side, suburbia's become so over-saturated with retail, it's hard to imagine many of the competitors see enough market share to make being in business worthwhile.